UPDATE: The letter of Archbishop Samuel Prakash obtained by The Australian has been released in the media here (pdf.). The former Australian head of the Traditional Anglican Communion has been questioned about his involvement in financial irregularities within the breakaway church. Archbishop John Hepworth, who was instrumental in seeking his church’s reunion with Rome, was forced to resign as the global head of the TAC in April, seven months after he raised allegations that he had been raped by Adelaide priest Ian Dempsey and two others in the 1960s. Monsignor Dempsey returned to work last week after he was stood aside by the church for 12 months. Police investigations into the matter are ongoing and the South Australian Director of Public Prosecutions, Adam Kimber, is considering whether or not to lay charges. In a letter obtained by The Australian and sent by the new head of the breakaway church, Samuel Prakash, to Archbishop Hepworth confirming the acceptance of his resignation in April, he raised allegations about financial concerns. “A report was delivered and tabled at the College of Bishops meeting with substantial supporting documentation concerning the financial situation in the church in Australia and your role in the same,” Archbishop Prakash wrote. The TAC, also known as Anglican Catholics, is a breakaway group from the Anglican Church with about 400,000 members around the world, including in Australia, Canada, England, Ireland, India, Pakistan and the US. The scathing letter, which discusses Archbishop Hepworth’s “very poor quality of leadership”, detailed concerns about alterations and additions to private properties owned by the former church leader and lay canon Cheryl Woodman. “Both you and Ms Woodman have made substantial alterations and additions to your private properties at the expense of the Australian church to accommodate the Office of the Primate, and I require details of those additions to private property from you, as well as the authorisation that preceded the construction thereof,” Archbishop Prakash wrote. The new global head accused Archbishop Hepworth of a “shocking lack of integrity” in his decision not to join the Catholic church as an ordinary citizen despite committing to do so if the church in Rome approved the reunification. Archbishop Hepworth said he had never made any alterations to his property, other than converting a disused bedroom into an office. “They may well be talking about the fact the church built an office and repository for documents on Cheryl Woodman’s property,” he told The Australian. Archbishop Hepworth said the TAC had bought a former church in the Adelaide Hills for $104,000, but sold it later for $400,000. He said the TAC used the profits of the sale to fund the office on Ms Woodman’s land at Lobethal in the hills outside Adelaide. A Catholic archdiocese source said allegations of financial mismanagement were raised when Archbishop Hepworth was administrator of the parish of Glenelg, a beachside Adelaide suburb, in 1974. He also faced court in Ballarat about 30 years ago charged with misappropriating $1200 from the Anglican parish of Sebastopol. “I wrote a cheque from a church account for a debt; there was no conviction recorded,” he said. 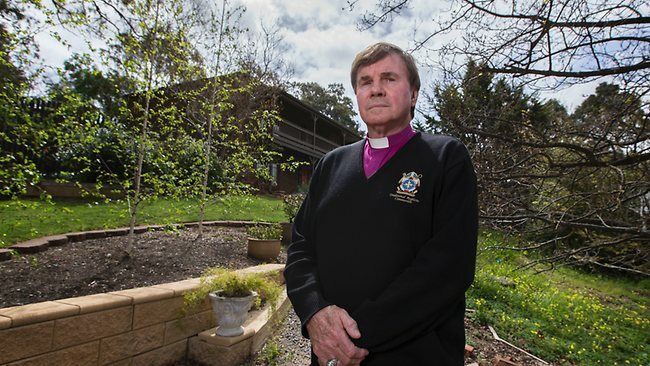 Monsignor Dempsey has maintained his innocence since Archbishop Hepworth raised his allegations, and has been given the full support of the Catholic Archdiocese of Adelaide to return to parish duties. Monsignor Dempsey said his hiatus had a serious impact on his health. “The pressure has taken its toll, and the stress of knowing that I’m innocent and having to put up with this ongoing investigation for some time.” He said his absence had created a ripple effect on his parish. Despite the police investigation continuing, an independent report commissioned by the church and conducted by Adelaide silk Michael Abbott cleared Monsignor Dempsey last year. “It concerns me that it hasn’t been concluded, even though I’ve been cleared by Mr Abbott,” he said. Financial mismanagement as a Catholic priest. Faced court for misappropriating funds as a Anglican priest. Financial concerns as a Continuing Archbishop. I prefer a man who sins and repents to one who does not sin and does not repent. The first has good thoughts, for he admits that he is sinful. But the second has false, soul-destroying thoughts, for he imagines himself to be righteous. In a bid to clear their city’s blocked sewers, authorities in Bulawayo, Zimbabwe, have a novel idea. We don’t know if Dynorod have any branches in Zimbabwe but based on this story coming out of the country, it doesn’t sound like they do. The second-largest city in the country, Bulawayo, has a problem with its sewers. They’re blocked and thanks to water rationing in the city, waste has built up in the pipes. But the lads in charge have come up with a brilliant idea to clear the blockage. They have asked everybody in the city to flush their loo at exactly 7.30pm on Monday. With almost 1 million people expected to take part, that’s a lot of water entering the system at once. And the plan is to do this every Monday, at 7.30pm, to keep the pipes clear. The city’s mayor, Thaba Moyo, tells Yahoo a bit more about it. “We are going to have a big flush every Monday to push all the waste that would have accumulated during the water rationing. It means everybody has to flush their toilet at the stipulated time which will be 7.30pm.